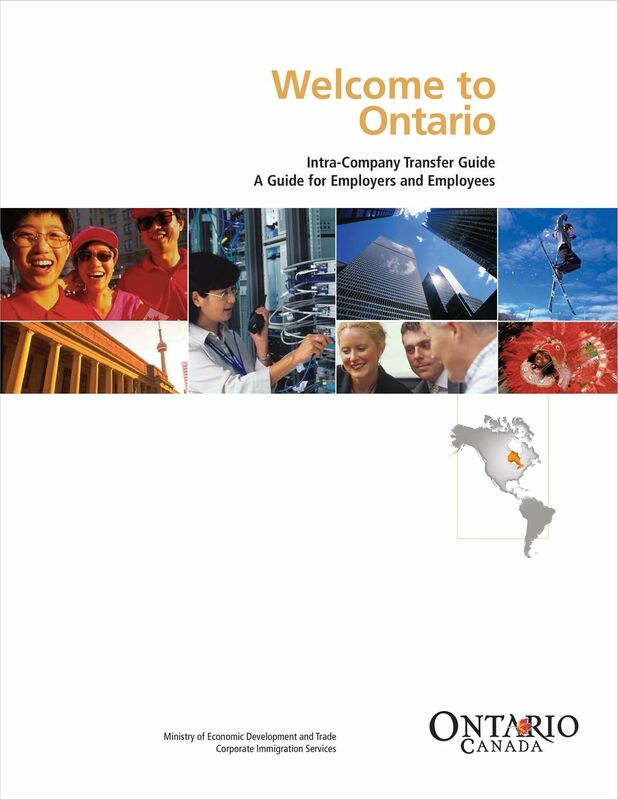 Download "Welcome to Ontario Intra-Company Transfer Guide A Guide for Employers and Employees"
2 Intra-Company Transfer Guide BACKGROUND Only Canadian citizens and permanent residents have the right to work in Canada. Anyone who is not a Canadian or Canadian permanent resident must obtain authorization from Citizenship and Immigration Canada (CIC) to work in Canada. International companies with operations in Ontario, or that will be establishing operations in Ontario, will likely choose to transfer key personnel or employees with specialized knowledge of company procedures for a temporary period to Ontario in order to continue the growth of the business. Intra-company transferees require a work permit in order to take up a position in Canada. This guide will help companies understand the process of applying for a work permit. 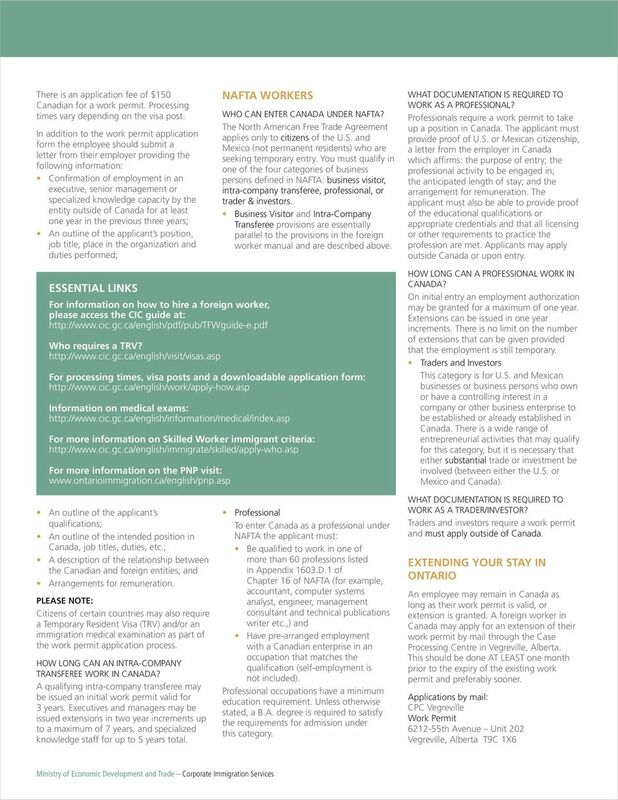 Specifically, this guide will provide advice on four types of workers: Business Visitors Intra-Company Transferees NAFTA Workers Spouses of Skilled Workers A WORK PERMIT is a document issued by the federal department of Citizenship and Immigration that allows a person who is not a permanent resident or Canadian citizen to work temporarily in Canada. Work permits are generally only valid for a specified job and employer as well as for a specific length of time. BUSINESS VISITORS WHO IS A BUSINESS VISITOR? A business visitor is someone who seeks to engage in international business activities in Canada without directly entering the Canadian labour market, and where the primary source of remuneration and place of business remains outside of Canada. Examples of business visitors include: Representatives of foreign businesses coming to explore investment opportunities or meet with Canadian companies; Buyers of goods or services; Company trainers/trainees coming to deliver or receive training in a parent, subsidiary, branch or affiliate of their company; After-sales service personnel as per a warranty or sales agreement, including supervising the installation of equipment or machinery purchased or leased outside of Canada, or to repair, service or provide familiarization services on such equipment. After-sales service does not include any hands-on building or construction that would generally be performed by a tradesperson. WHAT DOCUMENTATION IS REQUIRED FOR A BUSINESS VISITOR TO ENTER CANADA? Business visitors do not require a work permit but depending on nationality may require a temporary resident visa (TRV) to enter Canada. Business visitors should have a letter from their foreign employer which clearly states the purpose of their trip to Canada, the anticipated length of stay, and confirmation that their source of remuneration remains outside Canada. After-sales personnel must have a copy of the relevant sales, warranty or service agreement outlining the services to be provided. These documents should be presented at the time of entry. Business visitors are subject to normal visitor requirements and are normally granted entry for a length of time that is reasonable to fulfill the purpose of their trip to Canada. INTRA-COMPANY TRANSFEREES WHO CAN APPLY AS AN INTRA-COMPANY TRANSFEREE? 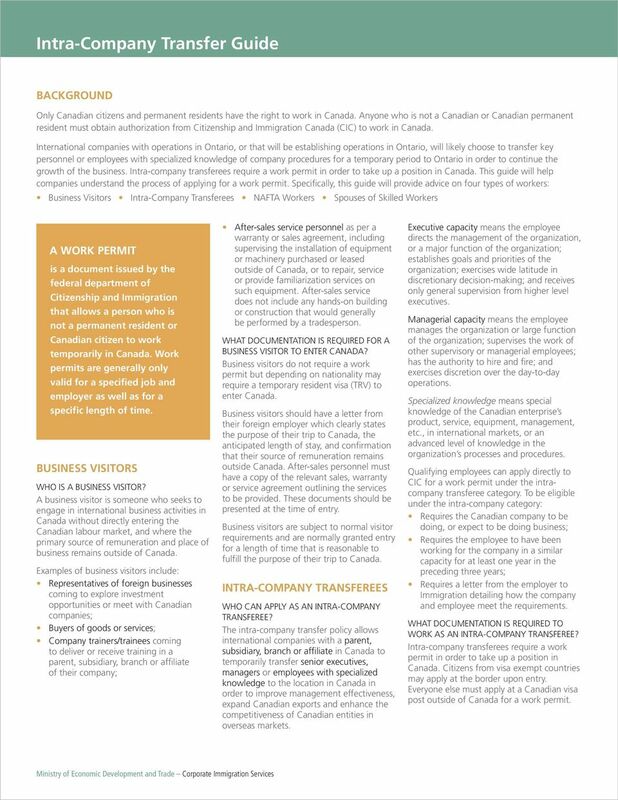 The intra-company transfer policy allows international companies with a parent, subsidiary, branch or affiliate in Canada to temporarily transfer senior executives, managers or employees with specialized knowledge to the location in Canada in order to improve management effectiveness, expand Canadian exports and enhance the competitiveness of Canadian entities in overseas markets. Executive capacity means the employee directs the management of the organization, or a major function of the organization; establishes goals and priorities of the organization; exercises wide latitude in discretionary decision-making; and receives only general supervision from higher level executives. Managerial capacity means the employee manages the organization or large function of the organization; supervises the work of other supervisory or managerial employees; has the authority to hire and fire; and exercises discretion over the day-to-day operations. Specialized knowledge means special knowledge of the Canadian enterprise s product, service, equipment, management, etc., in international markets, or an advanced level of knowledge in the organization s processes and procedures. Qualifying employees can apply directly to CIC for a work permit under the intracompany transferee category. 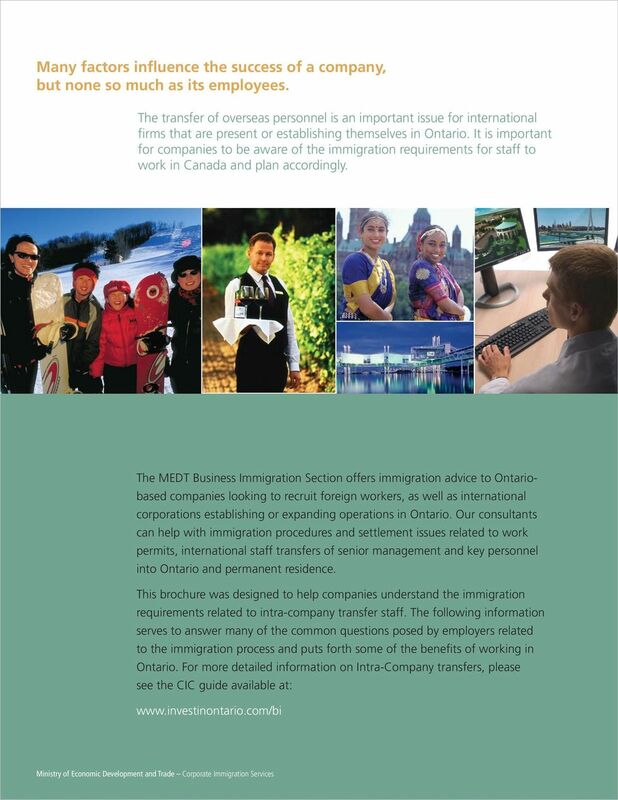 To be eligible under the intra-company category: Requires the Canadian company to be doing, or expect to be doing business; Requires the employee to have been working for the company in a similar capacity for at least one year in the preceding three years; Requires a letter from the employer to Immigration detailing how the company and employee meet the requirements. WHAT DOCUMENTATION IS REQUIRED TO WORK AS AN INTRA-COMPANY TRANSFEREE? Intra-company transferees require a work permit in order to take up a position in Canada. Citizens from visa exempt countries may apply at the border upon entry. Everyone else must apply at a Canadian visa post outside of Canada for a work permit. 4 SPOUSES OF SKILLED WORKERS The spouse or common law partner of a skilled worker may apply for their own work permit without the need for a job offer in Canada. 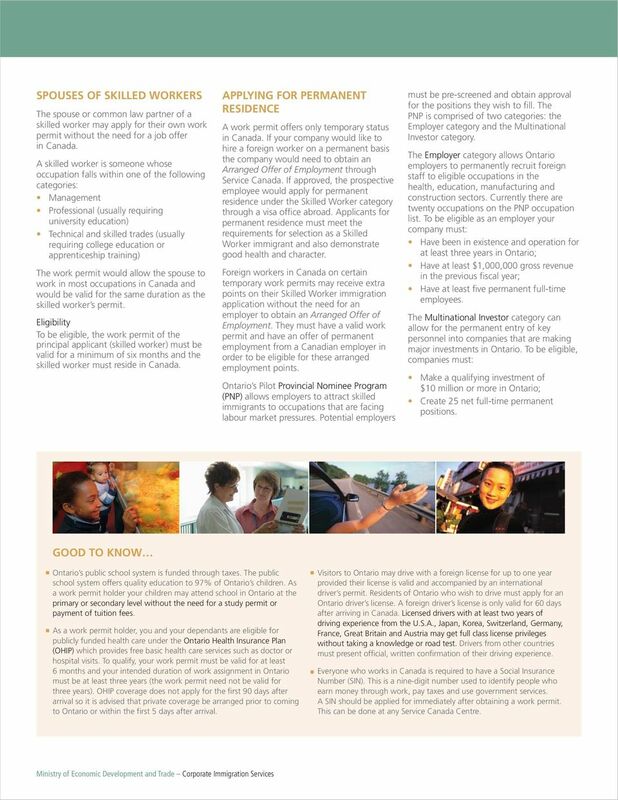 A skilled worker is someone whose occupation falls within one of the following categories: Management Professional (usually requiring university education) Technical and skilled trades (usually requiring college education or apprenticeship training) The work permit would allow the spouse to work in most occupations in Canada and would be valid for the same duration as the skilled worker s permit. Eligibility To be eligible, the work permit of the principal applicant (skilled worker) must be valid for a minimum of six months and the skilled worker must reside in Canada. APPLYING FOR PERMANENT RESIDENCE A work permit offers only temporary status in Canada. If your company would like to hire a foreign worker on a permanent basis the company would need to obtain an Arranged Offer of Employment through Service Canada. If approved, the prospective employee would apply for permanent residence under the Skilled Worker category through a visa office abroad. Applicants for permanent residence must meet the requirements for selection as a Skilled Worker immigrant and also demonstrate good health and character. Foreign workers in Canada on certain temporary work permits may receive extra points on their Skilled Worker immigration application without the need for an employer to obtain an Arranged Offer of Employment. They must have a valid work permit and have an offer of permanent employment from a Canadian employer in order to be eligible for these arranged employment points. Ontario s Pilot Provincial Nominee Program (PNP) allows employers to attract skilled immigrants to occupations that are facing labour market pressures. Potential employers must be pre-screened and obtain approval for the positions they wish to fill. The PNP is comprised of two categories: the Employer category and the Multinational Investor category. The Employer category allows Ontario employers to permanently recruit foreign staff to eligible occupations in the health, education, manufacturing and construction sectors. Currently there are twenty occupations on the PNP occupation list. To be eligible as an employer your company must: Have been in existence and operation for at least three years in Ontario; Have at least $1,000,000 gross revenue in the previous fiscal year; Have at least five permanent full-time employees. The Multinational Investor category can allow for the permanent entry of key personnel into companies that are making major investments in Ontario. To be eligible, companies must: Make a qualifying investment of $10 million or more in Ontario; Create 25 net full-time permanent positions. GOOD TO KNOW Ontario s public school system is funded through taxes. The public school system offers quality education to 97% of Ontario s children. As a work permit holder your children may attend school in Ontario at the primary or secondary level without the need for a study permit or payment of tuition fees. As a work permit holder, you and your dependants are eligible for publicly funded health care under the Ontario Health Insurance Plan (OHIP) which provides free basic health care services such as doctor or hospital visits. To qualify, your work permit must be valid for at least 6 months and your intended duration of work assignment in Ontario must be at least three years (the work permit need not be valid for three years). OHIP coverage does not apply for the first 90 days after arrival so it is advised that private coverage be arranged prior to coming to Ontario or within the first 5 days after arrival. Visitors to Ontario may drive with a foreign license for up to one year provided their license is valid and accompanied by an international driver s permit. Residents of Ontario who wish to drive must apply for an Ontario driver s license. A foreign driver s license is only valid for 60 days after arriving in Canada. Licensed drivers with at least two years of driving experience from the U.S.A., Japan, Korea, Switzerland, Germany, France, Great Britain and Austria may get full class license privileges without taking a knowledge or road test. Drivers from other countries must present official, written confirmation of their driving experience. Everyone who works in Canada is required to have a Social Insurance Number (SIN). This is a nine-digit number used to identify people who earn money through work, pay taxes and use government services. A SIN should be applied for immediately after obtaining a work permit. This can be done at any Service Canada Centre. L1is a Visa for multinational managers and internal transfer staff with special skills. U.S. ENTRY FOR MANAGEMENT CONSULTANTS The purpose of this document is to help members better understand their rights and to help them better prepare themselves to enter the U.S. on consulting assignments. Immigration Law and Nursing Working in Canada. Karen Kwan Anderson, B.A, LL.B. Introduction 70. Who can sponsor under the family class? 70. Who can be sponsored in the family class? 70. Can I sponsor if I live outside Canada? Introduction 70 Who can sponsor under the family class? 70 Who can be sponsored in the family class? 70 Can I sponsor if I live outside Canada? 72 Do I have to financially support the person/s I sponsor? CHOOSING THE BEST VISA FOR YOUR CLIENT - WHAT WILL WE COVER TODAY? Alberta Pork AGM November, 01 Navigating the Foreign Worker Process Martine Varekamp-Bos Regulated Canadian Immigration Consultant Agenda Hiring Foreign Workers the process s & exemptions Compliance NEW! 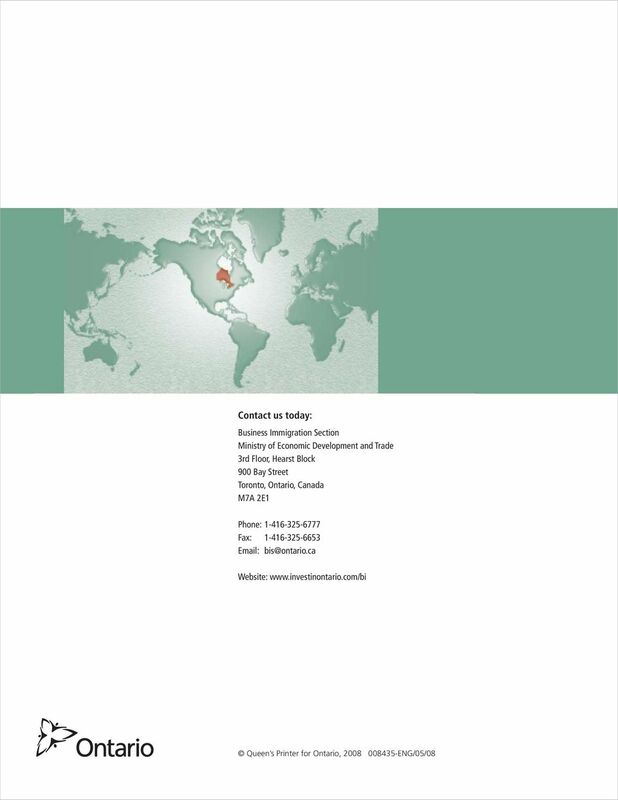 TN-1 NAFTA: A U.S. IMMIGRATION PERMIT FOR CANADIANS Main procedural step: Apply at the U.S./Canadian border. Initial duration of status: Three year maximum. Total time-limit cap on category: No time limitation.